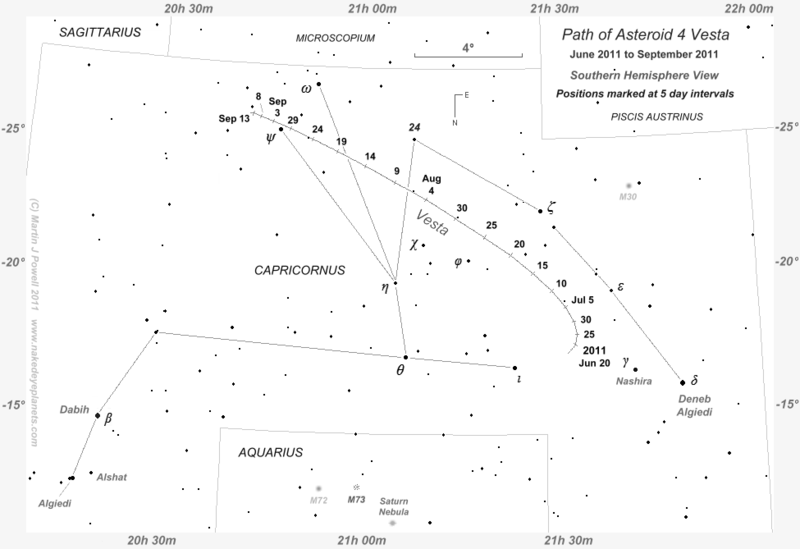 Finder Chart for Asteroid (Minor Planet) 4 Vesta during its period of naked-eye visibility in 2011, with positions marked at five day intervals (a Southern hemisphere view can be found here). Vesta was positioned in Capricornus and was brighter than apparent magnitude +6.6 throughout the period shown, reaching a peak brightness (for this opposition) of +5.6 on August 5th. The faintest stars on the chart have an apparent magnitude of +7.0. Binocular searches for the minor planet were best started from the Eastern end ('tail end') of Capricornus, 'star hopping' one's way from its brightest star Deneb Algiedi ( Capricorni, magnitude +2.9) through Nashira ( Cap, mag. +3.7) and across to the asteroid. Ideally, searches for Vesta should be carried out on Moonless nights, i.e. in the two-week period centred on the New Moon in any given month. 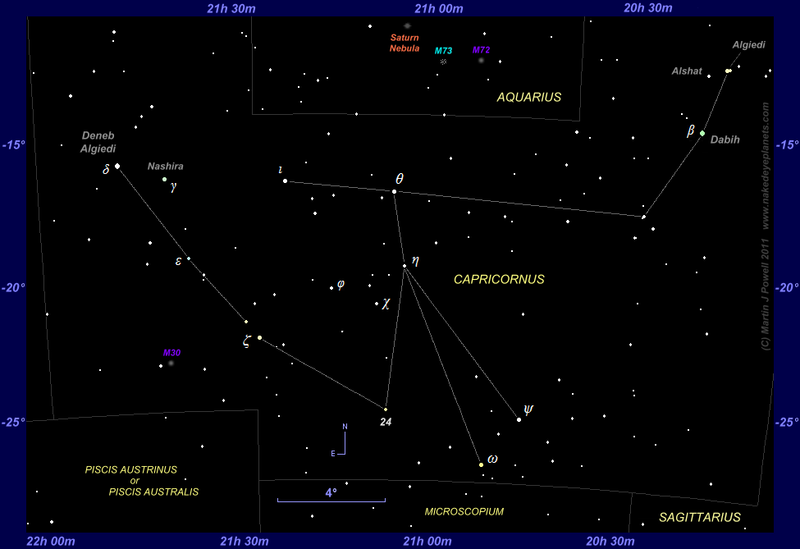 During 2011, Neptune was positioned on the Capricornus/Aquarius border, a short distance to the North-east of Vesta. Much of the star field in the chart should be easily contained within a binocular field of view (which typically ranges from 5� to 9�). Right Ascension and Declination co-ordinates are marked around the border for cross-referencing in a star atlas. Printer-friendly (greyscale) versions of the chart are available for Northern and Southern hemisphere views. 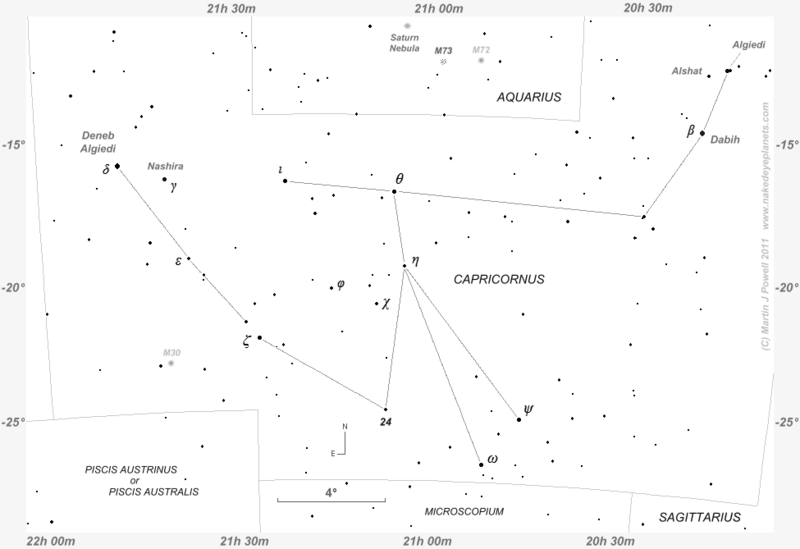 A 'clean' star map of Capricornus (i.e. with no asteroid track) can be obtained here and a printer-friendly version is here (for manually position-plotting). Also marked on the map is the globular cluster M30 in Capricornus and, in Aquarius, the globular cluster M72, the open cluster M73 and the planetary nebula NGC 7009 (commonly called the Saturn Nebula). All of these objects can be seen through binoculars and small telescopes under dark skies. Vesta makes one rotation approximately every 5 hours 20 minutes. This animation was produced by NASA from a series of Hubble Space Telescope images taken in 2007. The false-colour images combine near-ultraviolet and blue light (GIF animation converted from a NASA/HST QuickTime animation). Vesta is the only asteroid which reaches naked-eye magnitude (for this purpose, the naked-eye limit is assumed to be +6.0). It does so about once every 3 years on average, spending up to 9 weeks above magnitude +6.0 before fading out of view.2 Even though it is only the third largest asteroid (after 1 Ceres and 2 Pallas) it appears brighter in the night sky because of its closer approach distance to the Earth and its unusually light-coloured surface, which reflects a relatively high proportion of sunlight (Vesta reflects 42% of the incoming sunlight, a value which, when expressed as a decimal fraction, is known as the albedo).3 For comparison, the next brightest asteroids after Vesta are 2 Pallas (which can reach magnitude +6.7 at its brightest), 7 Iris (+6.9 at brightest) and of course 1 Ceres (+6.9 at brightest).4 Hence, even if the naked-eye limiting magnitude were extended to +6.5 (which is technically possible from dark sites with no light pollution) these three asteroids would still not be classed as naked-eye objects. 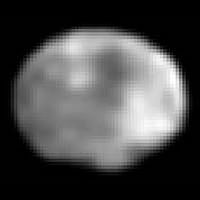 It is worth noting in passing that, owing to its size and shape, Ceres has since 2006 been classed as a dwarf planet, along with Pluto. Vesta's apparent magnitude ranges from +5.2 (brightest) to +8.5 (faintest).5 The brightest magnitude is reached whenever opposition occurs close to Vesta's perihelion (at opposition, a planet is closest to the Earth and brightest for the year). The fainter magnitude occurs when it is on the far side of the Sun from the Earth and close to its aphelion. When oppositions occur close to perihelion they are commonly referred to as perihelic oppositions; when they occur close to aphelion they are known as aphelic oppositions. Although Vesta's naked-eye visibility is brief, it can nonetheless be followed easily in binoculars for most of the rest of its orbit, during which time it is mostly above magnitude +8.0. Perihelic oppositions (ie. the brightest) take place when Vesta is positioned in the far-Southerly zodiac constellations of Scorpius, Ophiuchus or Sagittarius (eg. in 1989, 2007 and 2018). This mostly occurs during the Northern hemisphere late Spring period (late Autumn in the Southern hemisphere), Vesta usually attaining magnitude +5.3 or +5.4 around this time. Perihelic oppositions will therefore always be more favourable for Southern hemisphere observers because Vesta will be positioned at a high Southerly declination (angle from the celestial equator) around that time. Aphelic oppositions (the faintest) take place when the asteroid is positioned in the far-Northerly constellations of Cetus or Taurus (eg. in 1997 and 2012) and these mostly occur during the Northern hemisphere late Autumn (late Spring in the Southern hemisphere). Vesta usually attains a magnitude of around +6.4 or +6.5 at these times, just within naked-eye range from dark sites but easily seen through binoculars from elsewhere. 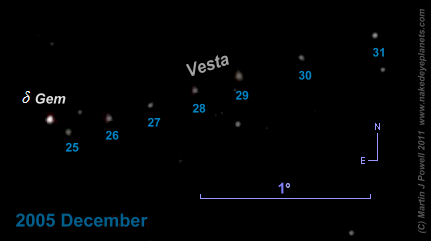 Vesta opposition data for the period 2010 to 2021. The phase angle, commonly quoted in asteroidal studies, is the Sun-Asteroid-Earth angle. When this is 0� the asteroid is fully illuminated by the Sun (i.e. the Sun, Earth and the Asteroid form a straight line in space). When the angle is greater than 0�, the asteroid is not fully illuminated and shows a degree of phase (ie. it is partly in shadow) when viewed from the Earth. The phase angle is one of several factors which determine the overall brightness of an asteroid. The declination (usually denoted by the Greek letter delta [ ]) is the angle of the planet to the North (+) or South (-) of the celestial equator. Also listed are the periods during which Vesta is visible with the naked eye during each apparition (for this purpose, the naked eye limit is taken to be magnitude +6.0). The years 2013, 2016 and 2020 are not included in the table because Vesta does not reach opposition in these years. The data for the table was obtained from ephemerides generated from The IAU Minor Planet Center website. 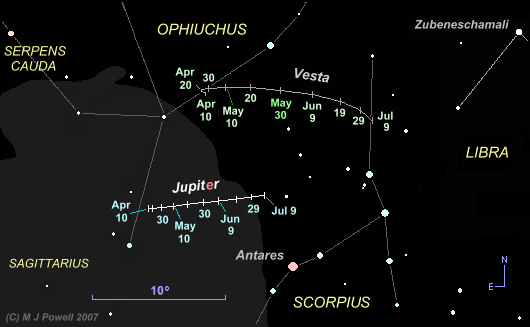 Note that because of Vesta's relatively high orbital inclination (the angle of the orbital plane relative to the ecliptic) of 7�.1, it frequently passes through the non-zodiac constellations Cetus and Orion, often making long, steeply-inclined curves as it moves from prograde motion to retrograde motion and vice versa. Vesta appears as a moving 'star' in this series of photographs taken by the writer in the closing days of 2005, when the minor planet was positioned in the constellation of Gemini. 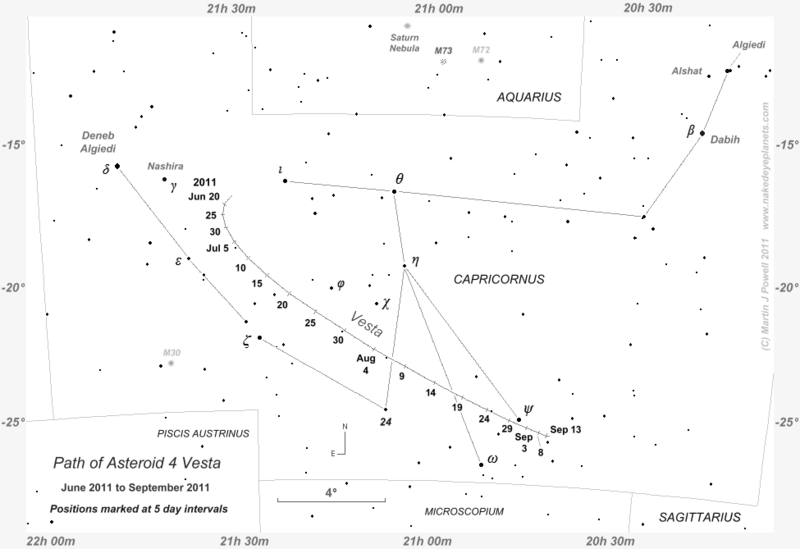 Vesta was retrograding at around magnitude +6.5 and reached opposition on January 6th of the following year. The bright star on the left of the photo is the double-star Wasat ( Gem, magnitude +3.5) which is located a short distance South of the ecliptic. The faintest stars visible in the photo are about magnitude 9.3 (move your pointer over the image to reveal all seven Vesta images, or click on the image). 'Potato-shaped' Vesta photographed by the Hubble Space Telescope in 1996, showing a large impact crater. To the naked-eye under ideally dark conditions, Vesta appears as a faint, star-like point of light near the limit of detection. Although unspectacular, its motion can be detected against the background stars from one night to the next - a process which can easily be detected with a tripod-mounted camera. This is the standard method by which asteroids are identified, and indeed this is how they have historically been discovered. Similarly, any camera or telescope set to track the motion of the stars at high magnification across the sky over a long period of time will often detect asteroids since the latter will appear trailed, moving at a rate of motion differing from that of the background stars. Asteroids were once nicknamed 'the vermin of the skies' because their trails often spoiled long-exposure photographs of other objects being photographed by observatories across the world. Today, with the very large numbers of asteroids known to exist and the potential threat posed by near-Earth asteroids (NEAs) most astronomers treat them with considerably more respect. Through a telescope, Vesta - like the other brighter asteroids - is a bright point of light, showing no detail. Many observers have noted that Vesta appears to have a reddish or a yellowish hue when seen through a telescope (the earliest known reference to it appearing yellow being from 1887)8. This accords with some of the brighter asteroids (eg. 3 Juno, 6 Hebe, 7 Iris) which appear slightly orange due to their being comprised of silicates with a high or medium iron content (much like stony meteorites).9 The colouration is subtle, however, and has been likened to the pale-orange hue of the zero-magnitude star Arcturus ( Bo�) in the constellation of Bo�tes, The Herdsman. Therefore, one should not expect to see any distinct colour when observing asteroids, particularly when using binoculars. At best, Vesta's apparent diameter (its angular size when seen from the Earth) is a mere 0".65 (0.65 arcseconds, where 1 arcsecond = 1/3600th of a degree) which is too small for any detail to be resolved using Earth-bound telescopes.14 To date, the best views of Vesta have been obtained by the Hubble Space Telescope. However, this is soon about to change. 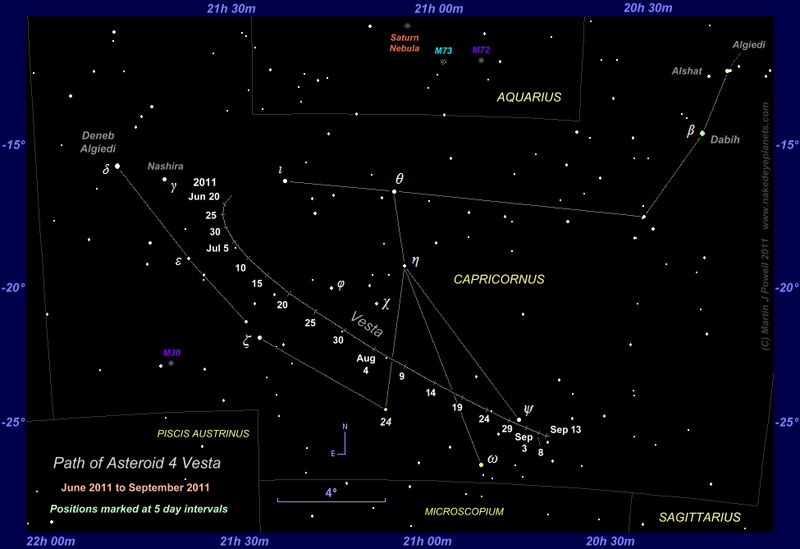 Prior to 2011, Vesta last reached naked-eye magnitude in 2007 on the border between the constellations of Scorpius and Ophiuchus. 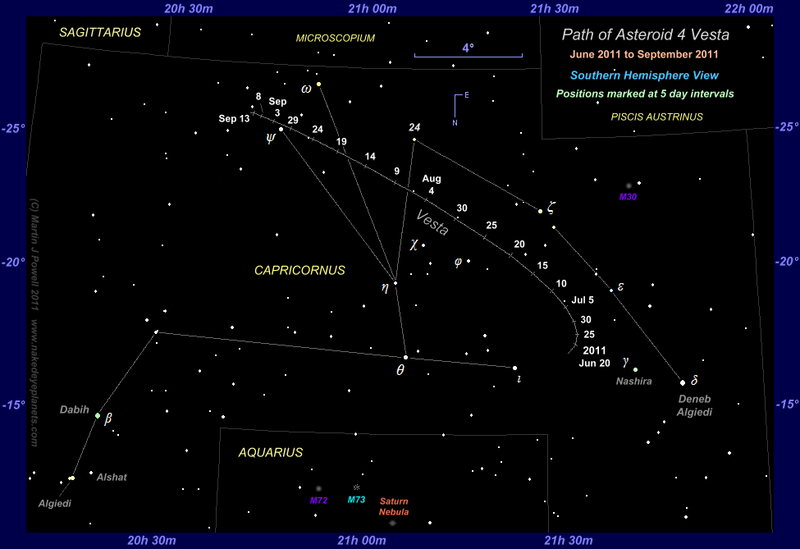 This star map shows the asteroid's position from April to July, with the bright planet Jupiter plotted nearby. 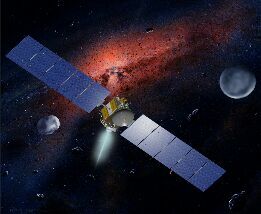 On September 27th 2007 NASA launched a probe named Dawn which will be the first spacecraft to observe Vesta from close-range.15 It is due to arrive at the asteroid in July 2011 and will orbit it for one year. It will then journey to Ceres (arriving in 2015) and will perhaps encounter another minor planet thereafter (depending upon the amount of fuel remaining). Vesta is an evolved and dry protoplanet, with a basaltic surface - a composition not unlike like our Moon.16 Astronomers class it as a 'V-type' asteroid, Vesta being the progenitor of this type and by far the largest example. Hubble Space Telescope images reveal ancient lava beds and powdery debris, the latter being remnants of impacts upon its surface a billion or more years ago. A particular focus of attention during the Dawn encounter will be a large impact crater close to the asteroid's Southern pole, which measures some 460 kms (285 statute miles) across and 13 kms (8 miles) deep, the result of which is likely to have distorted Vesta's shape. Most of the debris spewed out by this impact is thought to have entered into orbits of their own around the Sun. Some of this debris continues to orbit as Vestoids, trailing behind the asteroid, whilst other fragments have fallen to Earth in the form of basaltic achondrite meteorites (HED meteorites, for example, are believed to have originated from Vesta's crust).17 It is estimated that about 5% of all meteorite falls on Earth originated from Vesta. Thus far, the only images released by NASA have been either false-colour (imaged using near-ultraviolet and blue filters) or greyscale ('black & white', using red filters). For naked-eye and telescopic observers, the spacecraft mission will be of interest, not least since it should help resolve the question of Vesta 's colour when seen in visible light. The 2011 star chart was derived from the commercial software 'MegaStar' (by Willmann-Bell, Inc). Vesta's track was plotted using orbital elements obtained from the IAU Minor Planet Center. The star colours were based on those shown in "Patrick Moore's Colour Star Atlas" (Mitchell Beazley Publishers Ltd., London, 1973).